As a businessman, you want to be as most visible to your customers as you can. Being recognizable of course involves advertisements in various forms. Nowadays competition is very hard and companies try to take care of all the details of their promotion. It is very hard to find even a small company that operates without own websites, social media, search engines scores and more. 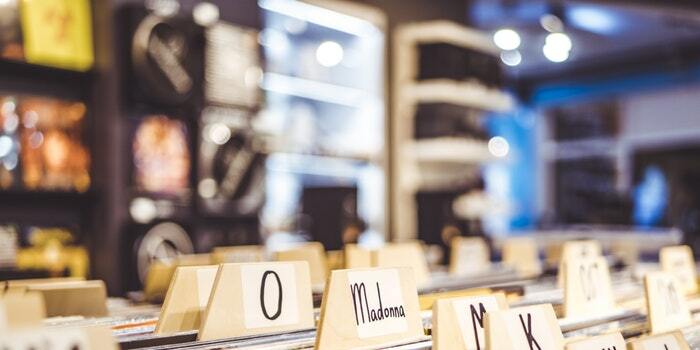 Although these methods are a well-known way to advertise your business, there are still some opportunities to make something more than the others. What we are talking about our business directories. A categorized list of local businesses in form of a business card of them. These business lists are a very useful tool to gain some attention and make your SEO better. Today we’re gonna focus on the directories in the motherland of moose, maple syrup and ice hockey: Canada. 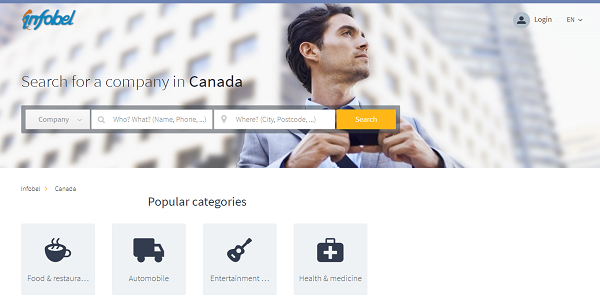 Datantify is one of the most developed Canada business listings. Nearly 1,5 million of companies categorized in 3657 industries are one of the best scores for this moment. And it’s all available for customers who can personalize their business list through the order. Although its offer is directed towards people who are looking for companies and business partners, and not for registering your business it is still a great option. 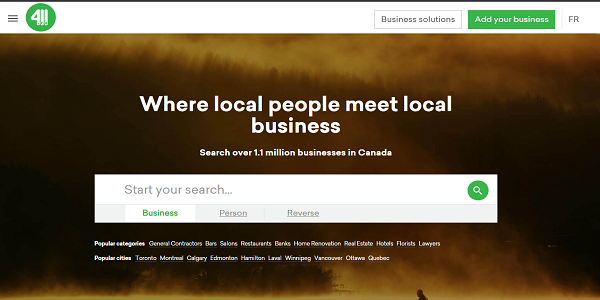 This online business directory in Canada took the market by the storm because of the 2 main reasons: it’s free and it’s very simple and user-friendly. You can register your company or search through the base of companies available (which is huge by the way). Very well developed tag system and transparent business sites view system are additional profits of this website. One of the first international digital business directories, founded in 1995. At this moment it has more than 200000 registered companies and nearly 68 million visitors a year. 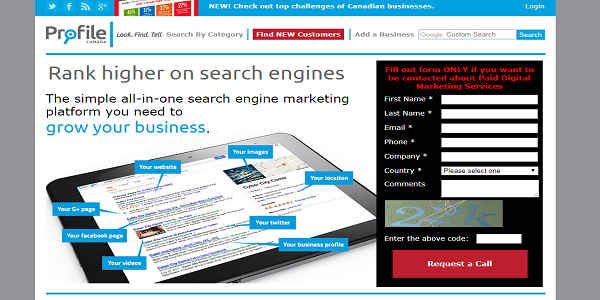 Easy to use, with rating a review systems it’s popular amongst Canadian business directories. 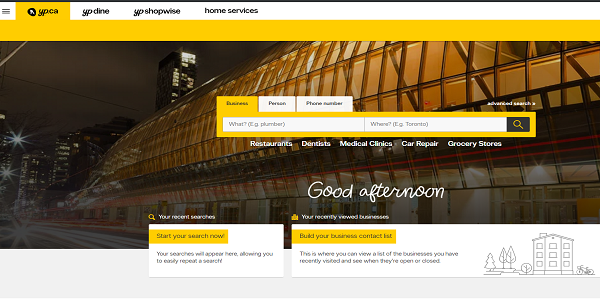 YellowPages is an international business directory, but it has country focused versions. One of them is yellowpages.ca, which belong to the list of most popular digital, online business listings in Canada. A huge number of companies, a well-developed business view system are the reasons why it is so popular. To this moment we described some business directories that are available not only in Canada but in the most part of the world. 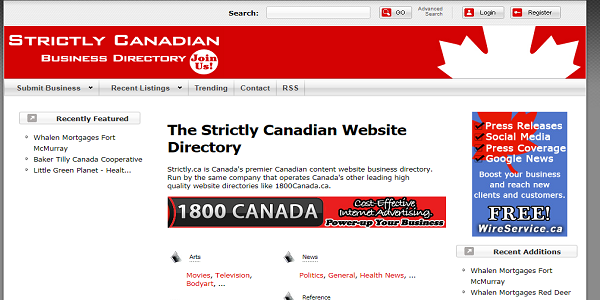 Strictly Canadian as the name says is the Canadian business listing that is entirely focused on Canadian businesses. 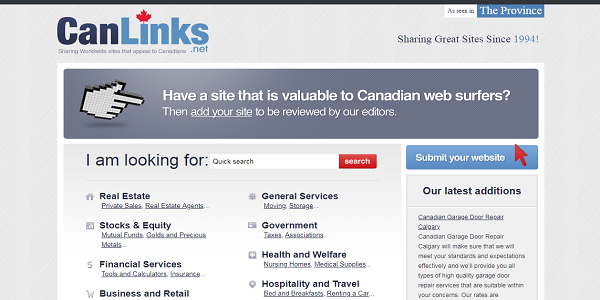 You can search or submit only for Canadian businesses on this site, which is great for local people and companies. Another Canada-only focused business listing. 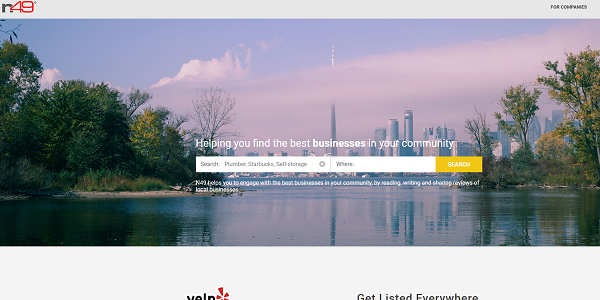 Although it is part of yellowpages.ca, Canada 411 business directory have its own database, which means you can find unique businesses. And this database is very big – there are over 1.1 companies in it. Targets of this website are small local businesses and communities, which helps everyone to find exactly what they’re looking for. Very good Canadian business listing in form of simple business cards. Good availability, user-friendly system allows to search for companies and add your own won in just a few seconds. Highly recommended for people who are looking for local businesses or want to advertise their own company. 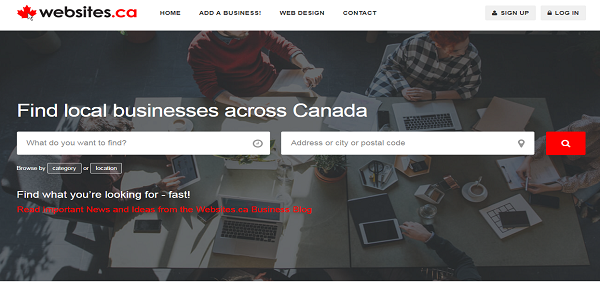 Another business directory that is focused on Canadian companies only. 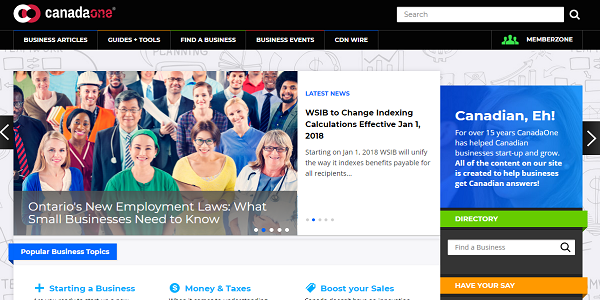 At the moment of writing this article, it has over 20.000 verified Canadian businesses in the database and a lot more registered businesses. It is very friendly for the company owners and it has some useful tools like financial ratios calc. 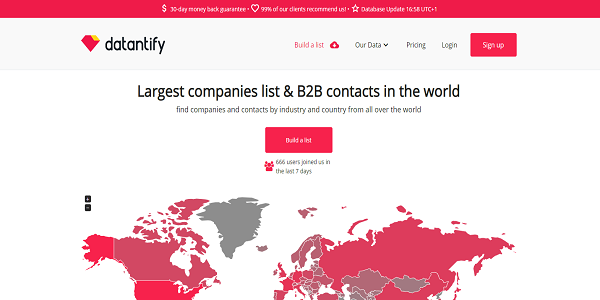 Very well built business directory with a lot of useful features for companies and users. It has a non-standard view of business – more like social media profile with all the useful information (addresses, numbers etc. ), a map view, link to company’s website and great review system that works like a charm. Definitely, one of the most unique and well-working business listing here. This site is different from the others because it is not a typical business directory. 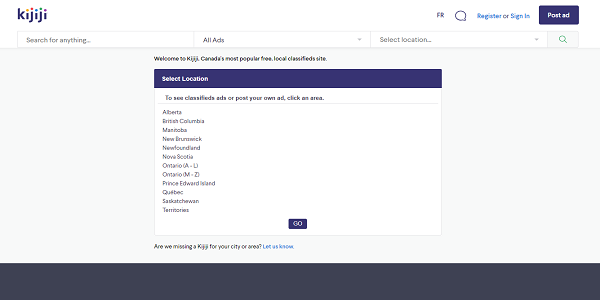 On Kijiji you can see or add your own advertisement in the wide range of categories. This is some form of community for Canadians that help them trade unused goods, find a job and more. Great platform based on the philosophy of second-hand goods, which can be used for small local business to advertise themselves for free. It is more like a local search directory, but it also accepts international businesses. They approve your entry to their business listing within 72 hours, which is the great result amongst the others. Navigation through the system is different than on the other sites – it doesn’t have a well know “business card” view, but the more “Google-like” view, with the direct links to the particular company website. 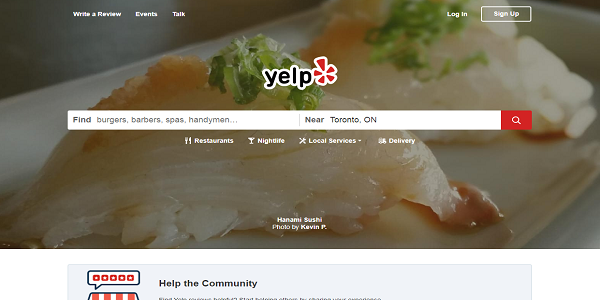 Because yelp is one of the biggest international business listings it is obvious that it will take a place in this rating. 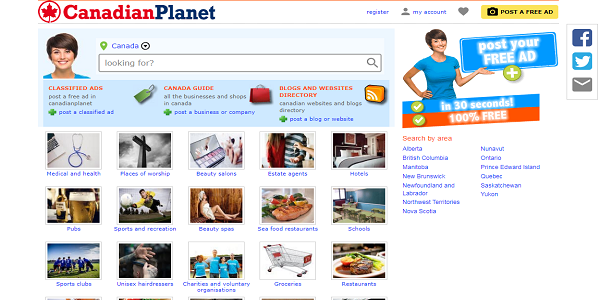 Huge database, easy to use, with review/rating systems – that’s why it is so popular worldwide and specifically in Canada. Another Canadian local business directory. Very well built, user-friendly and fast business listing with the rank system, available for free. Don’t delay, register today, and make your business visible for people! 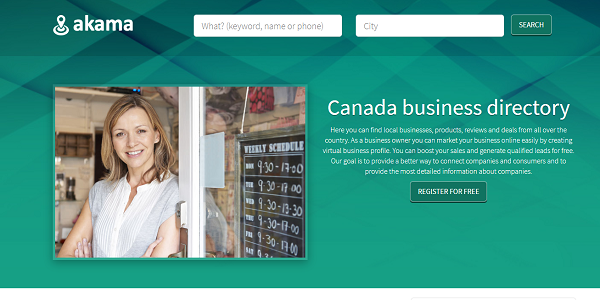 The main slogan of this business directory in Canada is: Look. Find. Tell. With millions of potential customers every year, this is a great platform to advertise your local business. Simple registration form and nice business presentation make it more useful for companies despite their size. It also has additional features like reviews and ratings which are great for users. 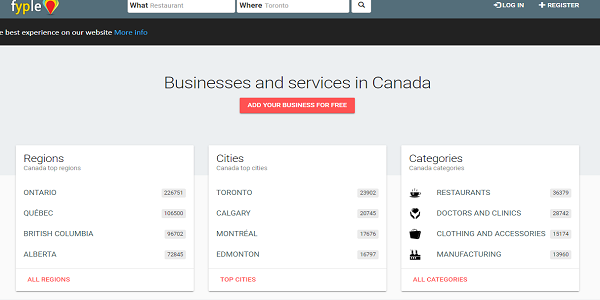 Another Canada-only focused business search engine. It is very simple in use – just a few clicks to find what are you looking for. Great tagging system, option to add your business location on a map for customers to view and your website link is more than enough to help your company grow. From landing page to what are you looking for in 4 clicks. This is exactly how this Canadian business listing works. 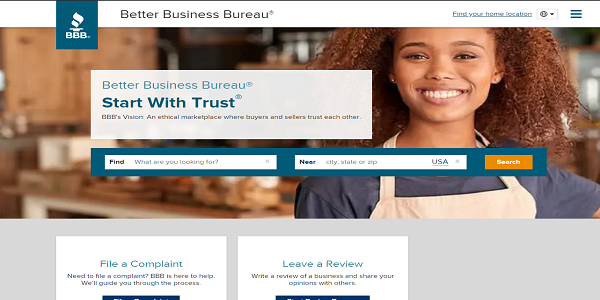 It also has some unique features like separate reviews and complaints systems and BBB accreditations. This listing is dedicated to people who are looking for business partners more than to people who want to register and advertise their companies. Avoid strange websites – some business directories sites are a scam that can hurt your website google position. Most of them want you to advertise their system on your website which is dangerous because Google look very precisely on every link and if the website you linked to is considered by systems as “bad” one it will destroy your hard work within hours. Prepare a precise description – most of these business listings allow you to add a description. Try to be as specific as possible when you write it. Add the most important information and a few words that will convince the customer to choose your services instead of the others. Watch out for misspellings and errors – double check all the information you put into the registration form. Sometimes you cannot change it which will result in some unexpected situations: loss of Google position, customers complaints about false information and more. Only approve the registration if you are sure that all entered information is true and correct. We hope that this ranking and tips will be useful for you and help you achieve success with your business. Thank you for your time and attention.